Finding the source of a leak from the shower is a detailed process of elimination. There are several steps you go through to determine the source of the actual leak. Sometimes you might think you know where the leak is at, attempt to repair it, and then discover that this was not the source. This is why it is essential to go through each step carefully to avoid unnecessary repairs. Step 1: Fill the shower pan with water. Shower pans can develop leaks if they are not sealed correctly or develop cracks where water can leak out and onto the floor from underneath the pan. Block the drain with a plug or some other object to stop water from draining out. Once filled, wait several minutes to an hour to see if water is leaking out from the shower. If not, then the leak is not with the pan. If it is, then replace the shower pan with a new one. You may want to call in a contractor or plumber for assistance. Step 2: Check the drain. Make sure the shower is completely dry. Then carefully pour several gallons of water down the drain slowly. 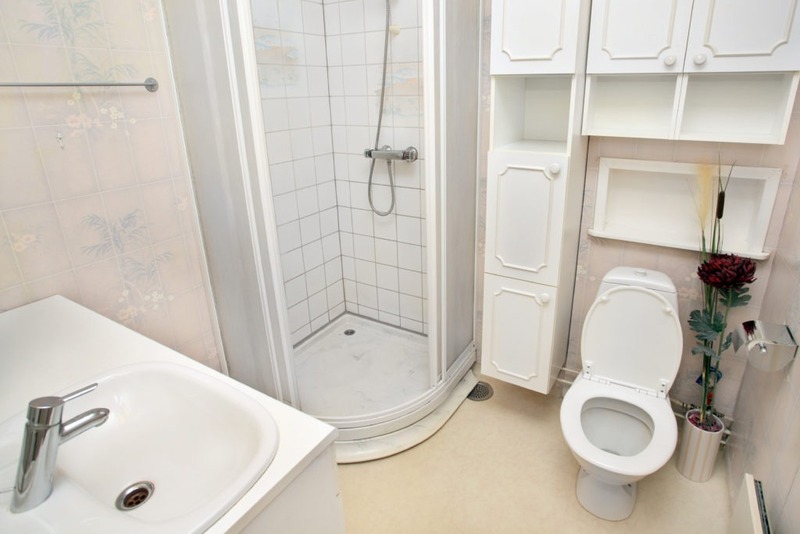 If you notice water leaking out from under the shower, then you have a leaky drain. To fix this problem, you will probably want to call your plumber since it requires removing several pieces of the shower for easier access. Step 3: Check the shower doors. Turn on the shower and close the shower doors. Look around where the door seals to see if water is leaking out of the shower. The seals on the door can wear out over time and have to be replaced. In some cases, the door may just need to be adjusted to correct this problem. If you have a track-type sliding door, look into the door tracks to see if water is overflowing out of the tracks. If this is the problem, then you want to add a larger exterior lip onto the shower track to stop it from overflowing out of the shower. Step 4: Check all caulking. Caulk can crack, break, and fall off over time. If the caulk is old, water can get under it and leak out of the shower. You will want to let the shower dry out completely, then remove all old caulking before applying new caulk to reseal the shower. The only time to skip these steps is if you are lucky and the source of the leak is coming from the shower head. First, check to make sure the head is screwed on tightly. If it is loose, it will leak. Next, with the water shut off, remove the head and see if there is plumbers tape around the end of the water line. If not, try using some plumbers tape and reinstalling the shower head. If it still leaks, all you have to do is replace the shower head with a new one. We hope these tips helped you find the source of your shower leak. For new shower pans, shower enclosures, and combo tub shower enclosures, please feel free to contact American Bath Enterprises, Inc. at (888) 228-4925 today!